Water, It’s a Big Part Of You and Me. I just got back from a glorious mini-vacation in Oregon for the long 4th of July weekend! I had a blast visiting family and packing each day with fun activities. I’m currently in the process of making a video/photo montage of the trip- which I worked on until the wee hours of the morning last night (cough cough I’m a perfectionist). I’m waiting on getting some more great photos from my cousin Tiffany before I complete it though- be on the lookout for it next week! 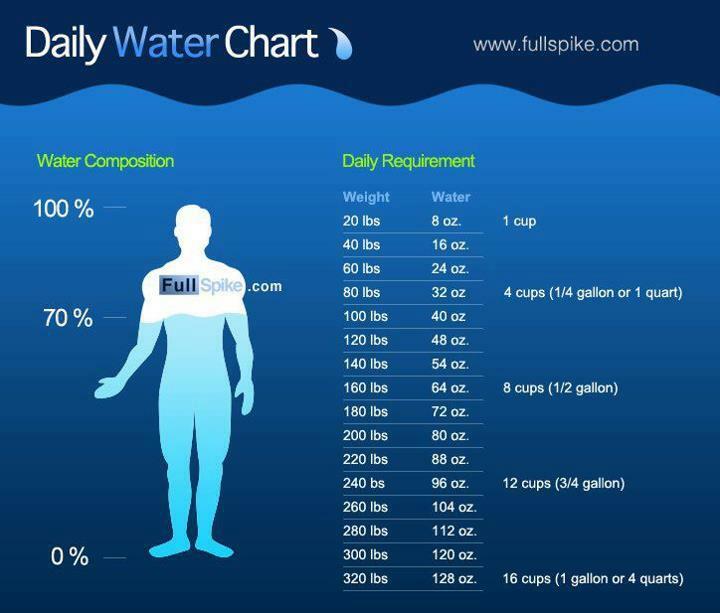 With heat waves hitting around the world- I thought it would be pertinent to pass along this water requirement according to your current weight. Infants bodies are made up of about 70-85% water, while adult men consists of 60-65% and adult women 50-60%..it’s pretty incredible. The human body itself is one walking wonder of evolution itself. From our highly developed brains (85% water) to our complex nervous system, humans are astounding living creatures. H2O is one of the best things you can consume in terms of curing health issues too! Doctors should write more prescriptions for water for all that it can treat: allergies, asthma, depression, high blood pressure, diabetes, headaches, chronic fatigue syndrome, colitis, alcohol dependency, lower back pain, neck pain, and the list goes on and on.. If you don’t like drinking plain water, spice it up with a lemon or lime wedge. Citrus juices are good for aiding digestion. Or throw in a couple fresh berries for come color and a splash sweetness! Very informational, thanks for sharing! That gives us all a goal to drink each day, thanks for the information Chanel! Hi! I’ve nominated you for the One Lovely Blog Award http://wp.me/p27eXb-8p Best Wishes! What an honor 🙂 Thank you!